Recommended to: Fans of the series, if you haven't started it yet you definitely should! Liv jumps at the chance, but her focus on finding Brianna’s killer is soon diluted. Piece by piece, the case reveals itself to be just one point in a harrowing series of murders. Spanning decades and the country, the web of crime Liv uncovers causes her to question everything—including the integrity of her own colleagues. For the first time since I started this series, it's actually been tough for me to write a review. It's no secret that I'm a huge fan of both Liv Bergen and her creator. I love Liv's vibrant personality, and the fact that she's such a down to earth person. In fact, I don't even bat an eye at this point when one of these books is offered to me for review. I'm a fan of Liv Bergen, and I'm not afraid to admit it. This time around though, I have to say that it took me a long time to fully settle in. 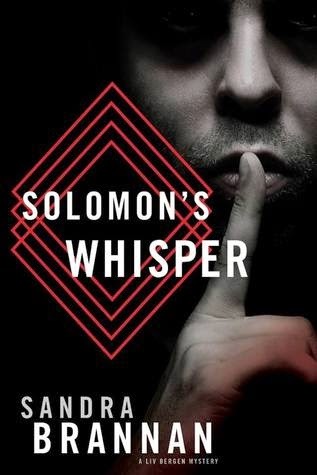 Solomon's Whisper takes a sharp turn from what I was used to previously. I'll explain below. One of the things I always enjoyed most about Liv's stories was that they weren't your typical crime novels. Her cases have always been rather personal, whether she was protecting her hometown or her family members. There's something comforting about knowing the person that you're following has a firm foot in the mystery they are solving. It was refreshing to be able to enjoy a story that dealt with the FBI and not have to slog through a ton of infodumps or hunt down terms. It's why I fell in love with Liv's books. She was always so personable and brave. That being said, this particular installment threw me off at first. To fans of the series, you'll remember that Liv is now working with the FBI officially. I was excited to see her in her new role. Eager to see where her new contacts and abilities would take her. The first third or so of the book centered around her settling in and, to be completely honest, took me a long time to get through. Those infodumps I wasn't missing before? They made their debut. It wasn't until Streeter gave Liv a case related to her, which I was hoping for, that things picked back up for me. Once again I was excited. Where would it take her? Unfortunately, this particular book doesn't deal with just one case. Instead, that one case branches off into multiple cases that are similar, and soon I found myself swimming in an overload of information. Names, dates, events, all blurred together into something that I just couldn't latch onto. It took me until almost the very end to feel fully immersed. Then that ending? It killed me. So much. I can't say I didn't enjoy this read. I still had Liv, and I was able to see how she'd grown. For that, I was appreciative. Everything else just didn't feel like what I was used to. It seemed like too much was going on at the same time, to be honest. For Liv, and for our past together, I'll offer up three stars to this book. Solomon's Whisper is the first time our leading lady has been fully tethered to the FBI, and it's probably just my own bias that kept me from loving it. I know I'll still be back for more.